This post was originally written by myself for the London School of Economics, who have full copyright. See the original post. At LSE we’re incredibly passionate about volunteering and the role that students play in changing the world for the better. Our most recent research shows that almost 50% of our undergraduates volunteer during their time at LSE, something we’re very proud of. Our students volunteer as mentors, campaigners, fundraisers, researchers, and in many other roles helping thousands of people each year. We know that this happens across universities up and down the country with 10,000s of young people contributing to the communities that they live in. Overseas volunteering is also extremely popular amongst students. Making a difference whilst forming new friendships in an exotic location; who wouldn’t be tempted by that? Volunteer tourism, voluntourism, volunteer travel, or overseas volunteering, call it what you like, has experienced massive growth over the past ten years. It’s seen by many as a rite of passage in modern times. But with such growth have come problems. Understandably volunteers want to volunteer to make an impact with those that need the help the most. More often than not they are pointed in the direction of vulnerable African or Asian children, particularly those that live in orphanages. 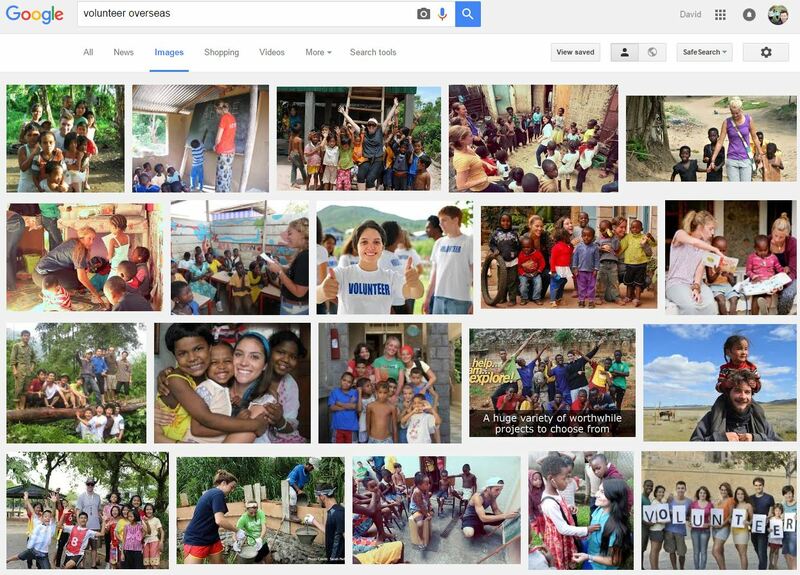 Google ‘volunteer overseas’ and the screenshot below shows the image results that appear. Young, mainly white, people teaching, cuddling and playing with children without a local adult in sight perpetuating the dangerous myth that international volunteers are needed ‘to give love’ to these children because they lack the relevant support in their own communities. There are hundreds, if not thousands, of agencies that are prepared to connect well meaning, but unqualified and illsuited, volunteers from the UK with vulnerable children in the global south. The business model for the sector is for volunteers to pay, sometimes thousands of pounds, for such opportunities. By taking part in such activities we’ve managed to make a commodity of spending time with children. Does that sound like helping? There are many reasons why volunteering in orphanages can be particularly detrimental to children: it can lead to child trafficking, sexual exploitation and psychological disorders. Along with the fact that many children in these residential centres have at least one living parent. Over 60 years of research shows the problems associated with growing up in a residential care home and we should all be striving to help keep families together not creating further demand for more orphans by continually sending volunteers to orphanages. Every volunteer centre at a university has to duty to inspire, but it also has a duty to educate students on how to make an ethical and sustainable difference and to give due thought before committing. At LSE we do that through articles, blogs, panel events and 1-1 discussions talking about the issues above. We strongly believe in cross-cultural learning and volunteering around the world and we advertise and promote 20-30 overseas volunteering opportunities at any given time. But we will not advertise orphanage volunteering and we are advocating that no university should promote such opportunities. We believe in this so strongly that we’ve created a pledge with colleagues at the Better Volunteering, Better Care Network and we’re encouraging other universities to join us by signing and sharing this pledge. The Student Volunteering Network in the UK has the ability to reach 100,000s of potential orphanage volunteers and educate them on how they can help the children they rightly care about, in different ways. By coming together we can stamp out this industry, that undermines our efforts to help students make a difference, and be proud of the way we made another improvement to society. This article is part of a month-long blogging campaign to #StopOrphanTrips co-ordinated by Better Volunteering, Better Care, a cross-sector working group of individuals and organisations campaigning against international volunteering in orphanages, and supporting responsible volunteering alternatives. Share this article using #StopOrphanTrips and sign the petition calling for travel operators to remove orphanage volunteering placements from their websites. If you work at a university volunteer centre and would like to add your support to the pledge please email David Coles on d.coles@lse.ac.uk.